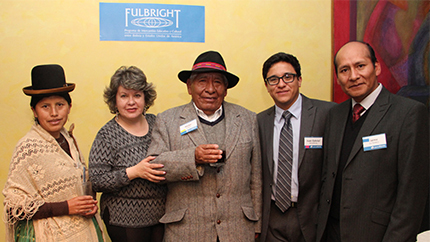 In September, more than 100 Bolivian alumni from La Paz, Oruro, Santa Cruz, and Cochabamba gathered for the launch of a new U.S. Embassy-sponsored professional mentoring program. The one-on-one mentoring program, which connects alumni by field in academia and business, will be implemented for 200 alumni in six different cities. By linking seasoned alumni of the Fulbright Program and International Visitor Leadership Program (IVLP) with young alumni of Study of the U.S. Institute (SUSI) and Youth Ambassadors, the program trains young leaders in the alumni community how to become effective mentors. In turn, Youth Ambassadors and SUSI alumni mentor English Access and College Horizons alumni who mentor current Access students.